John Rainbow joined the ranks of TransAm Trucking’s Million Mile Achievers! John is a company driver who started with TransAm Trucking in June of 2006. Like other Million Mile Jacket winners, his record is accident and late load free. So what makes him stand out above the rest? His sense of humor. John is a very observant individual and it comes across in his subtle humor. Within minutes of meeting him, he had me laughing. That’s the effect of his attitude. 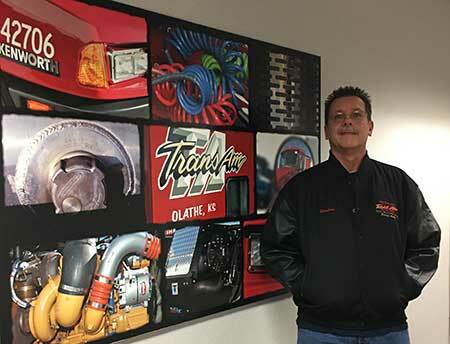 Over the years, it’s helped foster a good relationship between him and his Driver Manager, along with other members of the TransAm Trucking office staff. He is very easy to get along with and is quick to smile. It is clear John sincerely enjoys being a truck driver. If his driving record is not proof enough, his attitude definitely is. Being able to approach each day with a sense of humor is a great thing. We at TransAm Trucking appreciate John for choosing to drive for TransAm Trucking for the past 10 years. Drivers like John remind us that trucking is an important and noble profession. Congratulations, John, on your Million Mile Achievement! Thank you!